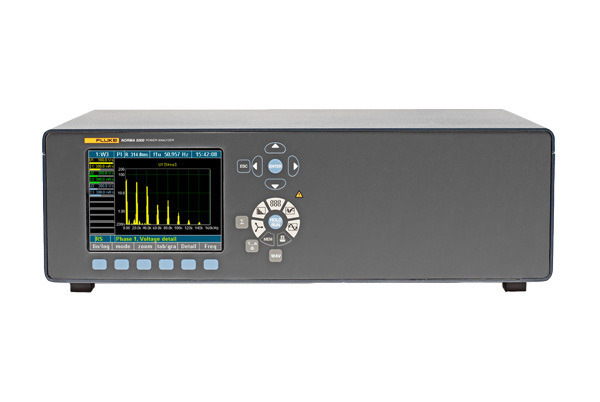 Providing the highest bandwidth on the market, the Fluke Norma 5000 Six-Phase Power Analyzer is the ideal test and analysis tool for the development of frequency converters and lighting equipment. Ideal for field testing, it offers easy and straight-forward operation with unmatched price performance. Features include: 3 to 6 power phases, optional internal printer, 5.7 in / 144 mm color display, harmonic analysis, scope mode, vector diagram display, recorder function, Fluke NormaView PC software and expandable 4 MB RAM data memory. 341 kHz or 1 MHz sample rates for detailed signal analysis. Reliable, highly accurate measurements for the test and development of power electronics. The Fluke Norma 5000 Six-Phase Power Analyzer is a rugged, high-precision analyzer providing unmatched price performance for easy and reliable use in the field, or as a bench unit in laboratories and on test benches.